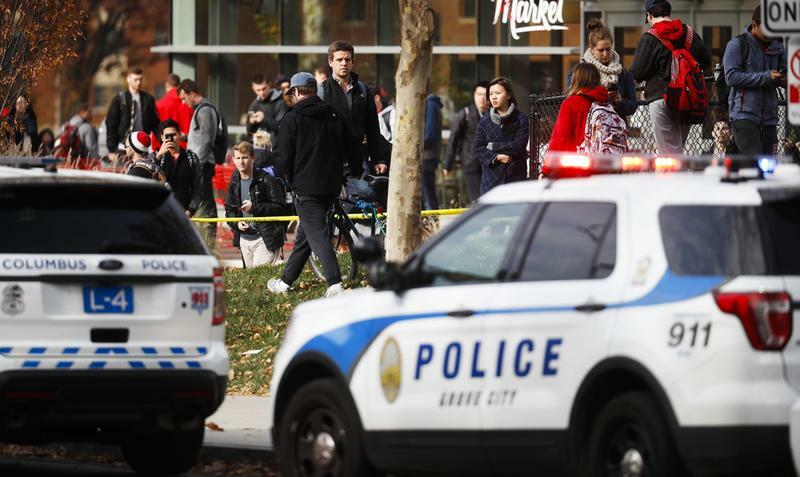 It was about 9:50 a.m. on Monday morning when a man drove his car into a group of pedestrians at Ohio State University. He then exited the vehicle and began stabbing people with a butcher knife he was shot to death by a police officer, authorities said. Nine people were hurt, one critically, and police said they were investigating the possibility it was a terrorist attack. The FBI and other agencies are also investigating. Details regarding the incident emerged after a morning of confusion and conflicting reports that began with the university issuing a series of tweets warning students that there was an "active shooter" on campus near the engineering building and that they should "run, hide, fight." "Run, hide, fight" is standard protocol for active shooter situations. It means: Run, evacuate if possible; hide, get silently out of view; or fight, as a last resort, take action to disrupt or incapacitate the shooter if your life is in imminent danger. 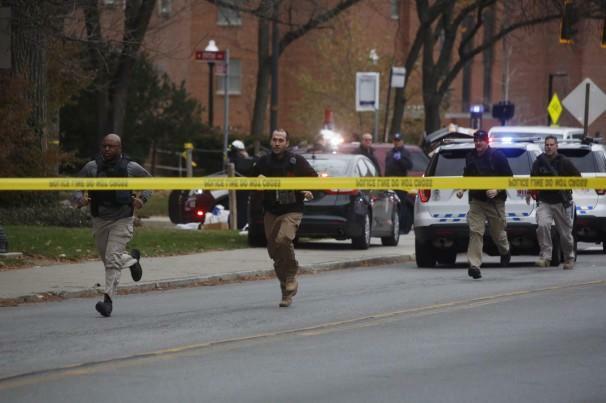 Numerous police vehicles and ambulances converged on the campus that has 60,000 students. Authorities blocked off roads as students hunkered down indoors as officers swarmed the campus grounds. Ohio State Police Chief Craig Stone said that the assailant deliberately drove over a curb outside a classroom building and that an officer who was nearby because of a gas leak arrived on the scene and shot the driver in less than a minute. Ohio State University Police Chief Craig Stone said this was a deliberate attack. "To go over the curb and strike pedestrians, and then get out and start striking them with a knife — that was on purpose," he told reporters during the news conference. The have not ruled out this being a terrorist attack. In recent months, federal law enforcement officials have raised concerns about online extremist propaganda that encourages knife and car attacks, which are easier to pull off than complicated bombings. The Islamic State group has urged sympathizers online to carry out attacks in their home countries with whatever weapons they are able to acquire. At least two people were being treated for stab wounds, four were injured by the car and two others were being treated for cuts, university officials said. The attack came as students were returning to classes following the Thanksgiving holiday break and Ohio State's football victory over rival Michigan that brought more than 100,000 fans to campus on Saturday. Classes have been canceled for the rest of the day.